QH150/300/450/ 600 hard candy depositing line is a compact unit which can continuously produce various kinds of hard candies under a strict sanitary condition. It is also an ideal equipment which can produce out good quality products with the saving of both the manpower and the space occupied. * One set of extra chocolate paste injection system for making chocolate-central candies; "two/three-color striped depositing","two /threecolor double layers depositing", "central filling", "clear" hard candies and etc. can be made. * Moulds can be made according to the candies samples provided by the customer." Looking for ideal Candy Production Line Manufacturer & supplier ? We have a wide selection at great prices to help you get creative. 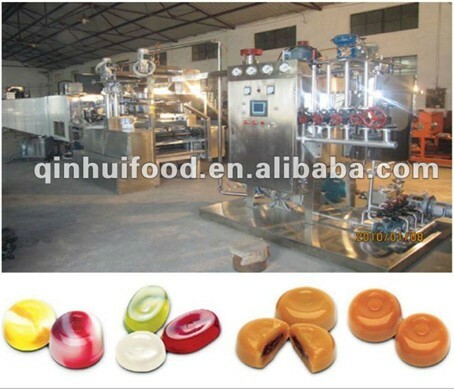 All the Candy Production Line are quality guaranteed. We are China Origin Factory of Candy Production Line. If you have any question, please feel free to contact us.